Add Thin Style CSS Drop Down Hover Navigation Menu Bar | BloggersStand ';-1!=b.indexOf("img.youtube.com")&&(a=' ');d=a+''+p+''+titlex+"
If you have any query regarding Beautiful Thin Style CSS Drop Down Hover Effect Navigation Menu Bar for blogger.it give amazing look to your website or blog.Feel free to ask,just drop your comment below. 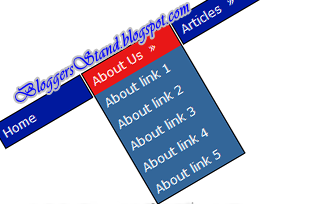 how to add Add Thin Style CSS Drop Down Hover Navigation Menu Bar into for blogger blogspot,red blue colour color combination drop down menu navigation bar for website with hover effect. So Far 2 Comments on "Add Thin Style CSS Drop Down Hover Navigation Menu Bar" - Post Yours! Manish you can look your code and remove it. Or share your code with us. you can also add our this navigation menu to your blog.